← How can I email generated PDF file silently via SMTP protocol? PNG is the extension name of the digital image format Portable Network Graphics. As what its name implies, PNG is created specially for sharing and presenting digital images on the Internet. For GIF format was also designed for the Internet usage, PNG was developed for replacing GIF format because PNG standard does not need a patent license. For funny, PNG sometimes stands for “PNG is Not GIF”. PNG supports 8-bit and up to 64-bit colors while GIF just supports 8-bit colors. In addition, PNG supports a higher level of image transparency than GIF does. PNG currently is widely used in open source projects and the Internet image displaying. 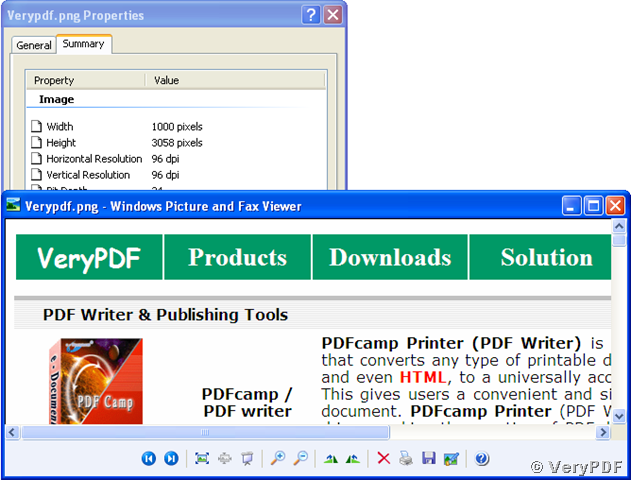 You can convert a document stored in html to png image using one function of the tool VeryPDF HTML Converter Command Line. The powerful tool supports running in MS-DOS command mode. You can type the following commands into the command prompt window to convert the html to png. In the lines, “D:\htmltools\htmltools.exe” launches the executable tool and “D:\htmltools\Verypdf.html” specifies the name of source document. “D:\htmltools\Verypdf.png” indicates the path and name for the output converted image and the target format of the conversion. The prompt tells you that your document is converted from html to png and output with specified file path and name successfully. The default resolution of converted image for this case is 96 dpi and the width and height are dependent on the width and height of your html document. How to rotate the page while converting wmf to pnm? How to rotate the page while converting url to tiff? This entry was posted in HTML Converter (htmltools) and tagged html converter, HTML to image, html to png, html2image, VeryPDF HTML Converter. Bookmark the permalink.